This is going to be totally off subject but go with me on this one. I’ll get to the point. It could be awkward. Have you ever been cheated on and the cheater says “It was an accident!” Whoa. What does that mean? WHOOPSIE just accidentally fell into a compromising position! Riiight. You still with me? Cuz this is going somewhere. I was talking to a friend yesterday who was happily buzzed and she giggled and said it was an accident. That perfectly mixed drink accidentally fell into her mouth. Repeatedly? Whoops! We don’t buy it, do we? But that’s how these treats were born. Don’t ask any questions. Try not to judge. 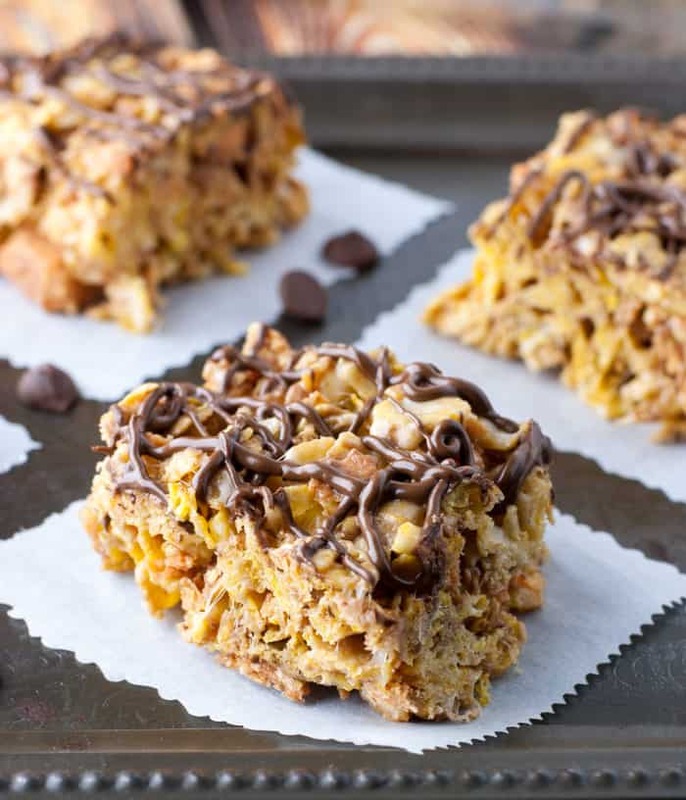 But a Corn Flake (or two) and a chunk of Butterfinger accidentally ended up in my mouth. At the same time. Uh huh. Interesting, you say. I don’t remember how it happened. I don’t remember making any conscious decisions about these flavors being consumed simultaneously, but I do remember the moment the taste hit my tongue and I was like HEY this is awesome. 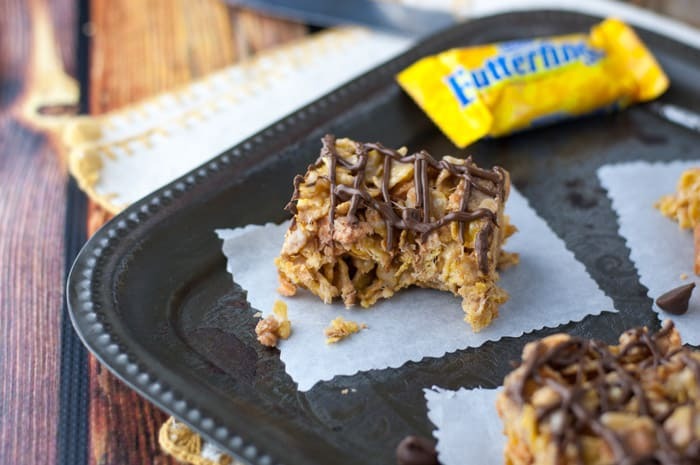 Enter: Crispy Flaky Butterfinger Treats. Ta da! [Raises hand, guiltily] I guess that was me? 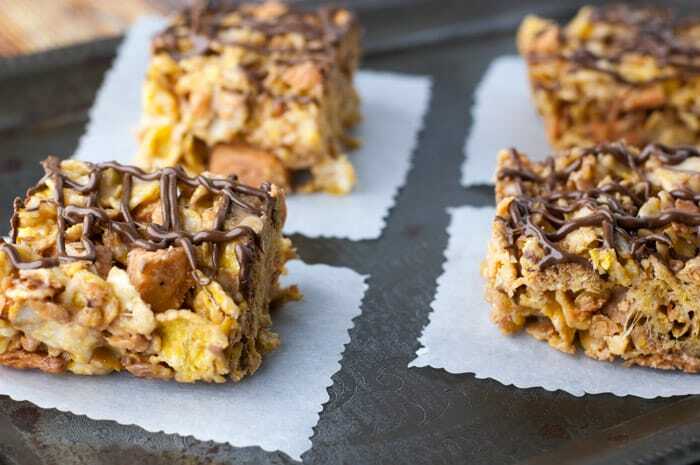 These crispy Butterfinger Treats are like giant explosions of Butterfinger crunchies in your mouth. They’re so good you will actually eat them on purpose. Unless you “accidentally” eat like 5 and then it totally won’t be your fault. Spray 8×8 baking dish with cooking spray and set aside (you could use 9×13 but they will be thinner). In large saucepan or Dutch oven, melt butter over medium-low heat. Add marshmallows and stir occasionally until all marshmallows are completely melted. Take pan off heat and stir in Corn Flakes making sure they’re evenly coated. 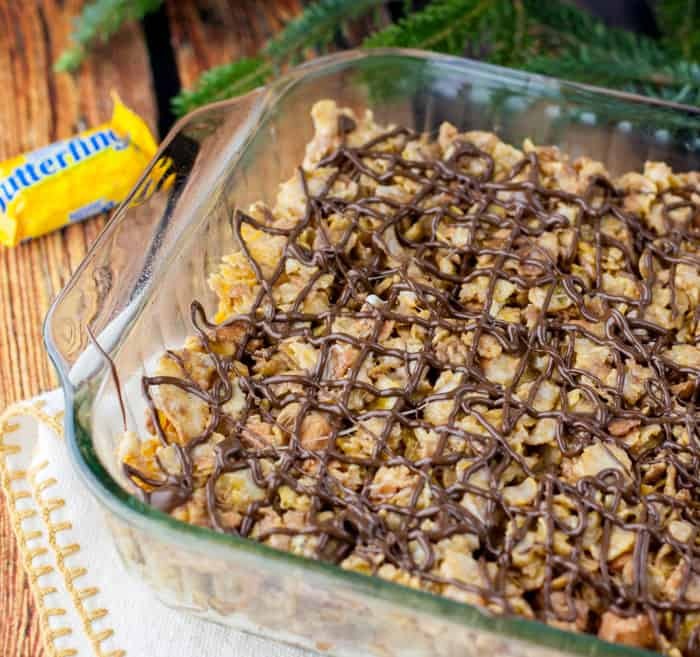 Add chopped Butterfingers to pan and stir until evenly distributed. 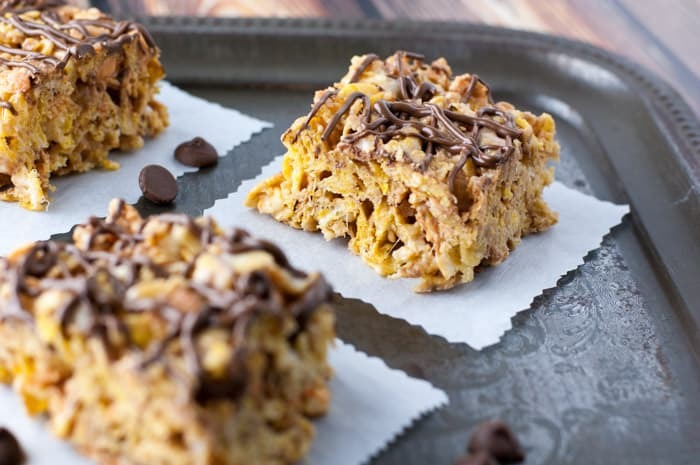 Put Corn Flake mixture immediately into baking dish and press down with a buttered spatula. Mixture will be very sticky. Let cool for 20 minutes. 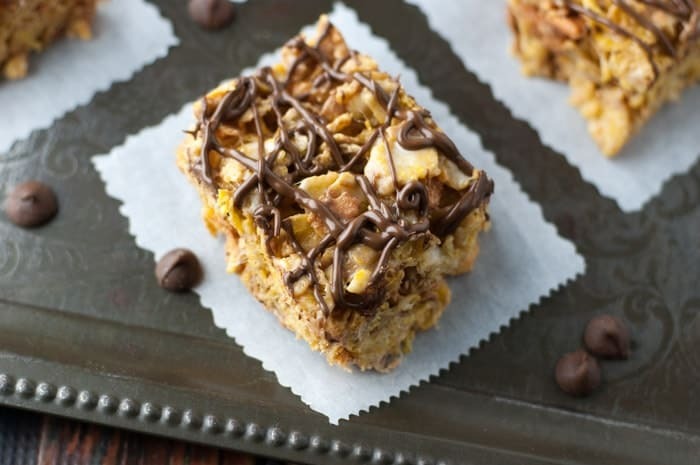 Melt milk chocolate chips in double broiler*** . Once chips are melted, drizzle over treats. Let cool. Cut and serve. Can be stored up to 2 days in air tight container. You can also freeze them. 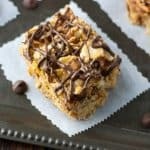 *You can use Rice Krispies cereal if you prefer, but I thought the Corn Flakes gave a nice salty/sweet flavor to the bars. **You could experiment and use semi-sweet chips if you prefer. There are no rules! ***If you don’t have a double broiler, you can simmer about 2 inches of water in a pan, put chocolate chips in a glass bowl and put the bowl over the pan and let the steam melt the chips. I just printed this! I am making these this week for sure. YUMMMMM! Yay! Butterfinger for everyone! Let me know what you think. These look so NAUGHTY. And I LIKE IT. Hi Jessie! Yes – these are evil little devils! I visited your blog and I like your mission and writing. Being a cake spy would be the perfect career for me. 🙂 Thanks for stopping by!